I'm a real Belgian girl which means that I love my Belgian chocolates. 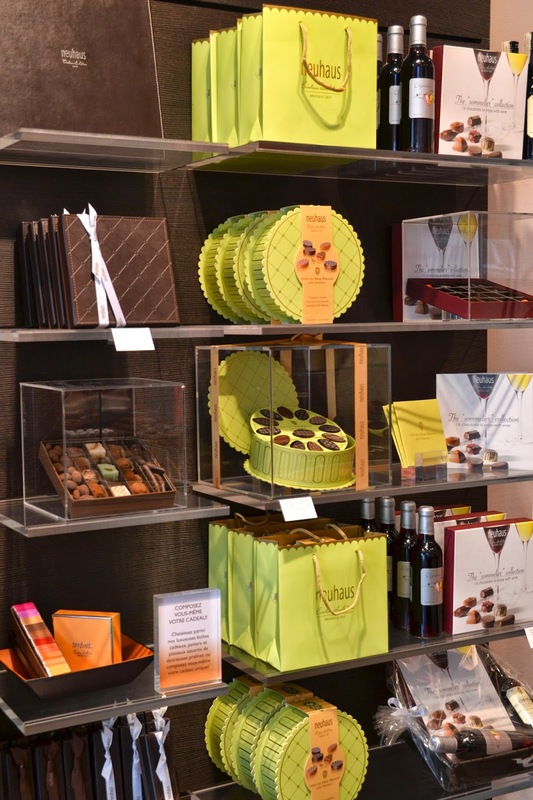 Neuhaus is an iconic Belgian chocolatier which stands for quality. We Belgians are spoiled when it comes to delicious chocolate. I always turn to chocolate whenever I have something to celebrate or when I just deserve a treat after a long week. And the best part? You can just order it from your home! YES! 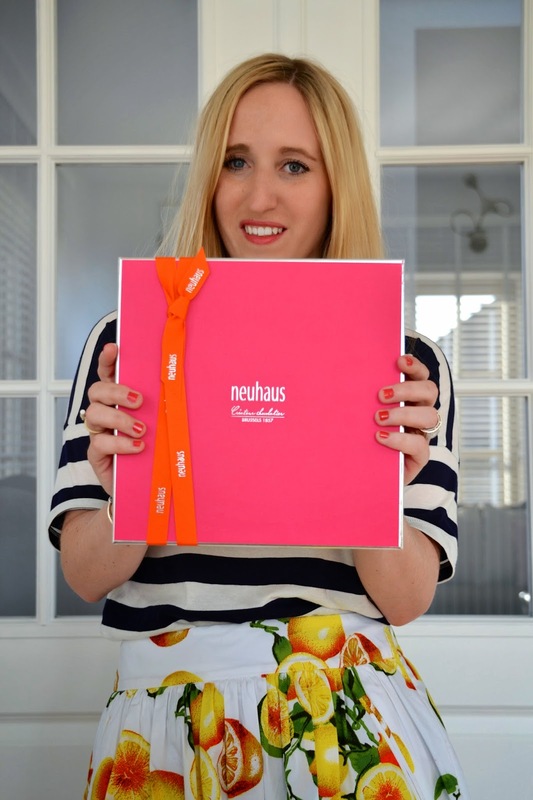 Neuhaus has an online webshop where you can shop, shop, shop! 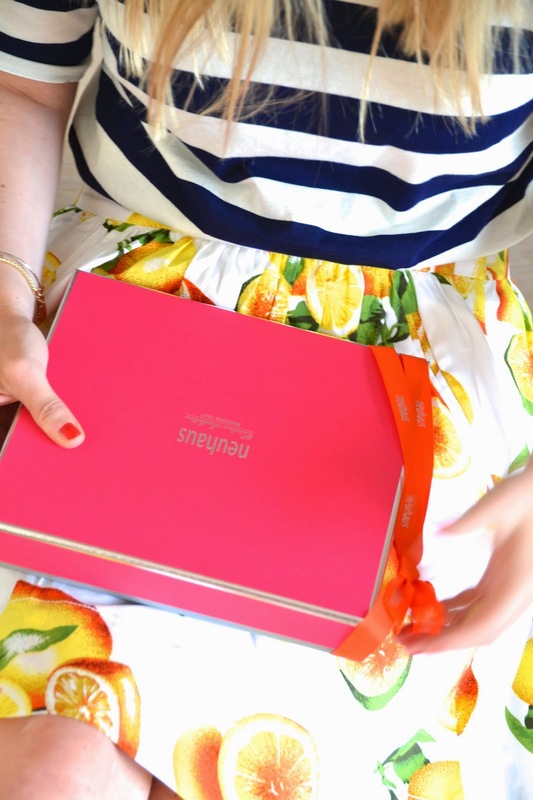 Neuhaus recently got a makeover and their modern stores now offer pretty colorful luxury boxes for chocolates. A real treat if you ask me! Earlier this week I visited the Neuhaus store in Brussels (Louizalaan 61, 1050 Elsene) where I got the chance to discover their newest creations . Choosing was difficult. The 'Haute Patisserie' collection is a luxurious green round box filled with 27 pralines created by chefs from around the world and it's almost too pretty to eat ! I felt like a little kid in a candy store and I could just eat every single praline in the store :-). Macarons are my personal favorite and that's just what I choose. I opted for the bright pink box and the orange silk ribbon. Those 2 colors match so perfectly. What do you prefer : Macaron or praline ? Which Neuhaus chocolate must I try next ? LOVE your outfit! 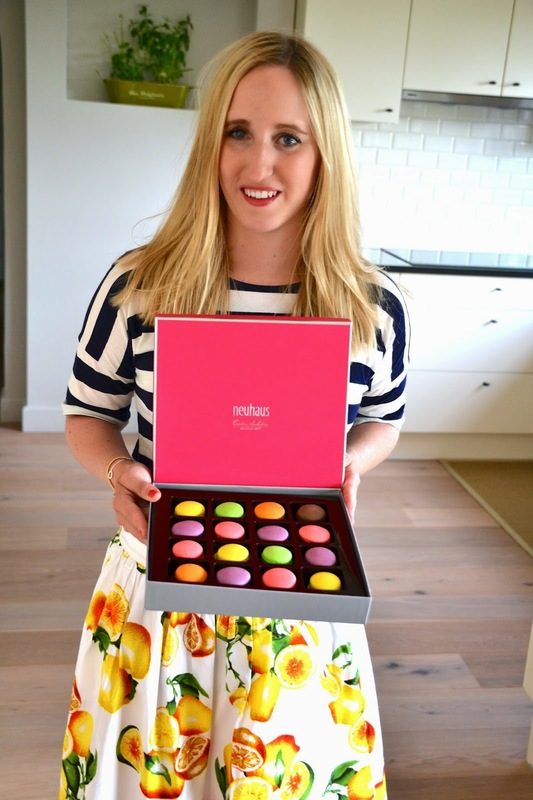 <3 and I also love that your macarons match your outfit :-) Will try them next time at Neuhaus! Leuke foto's, ziet er yummm uit! that box though! i love it. *sweet* post! One of the things I loved about Bruges was the fabulous chocolate and Neuhaus is a favoutite brand of mine. 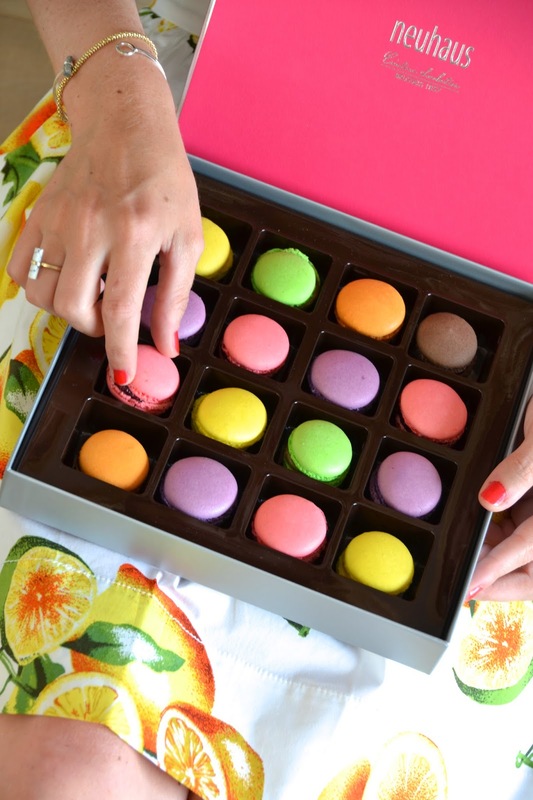 I like the print of your skirt - a perfect choice for the photo with the macarons. Ohhh, so beautifully done! I'm obsessing about the whole idea of lemons as a print, and navy stripes surely look like a perfect match to it. Who doesn't love tasty treats and beautiful fruity patterns? 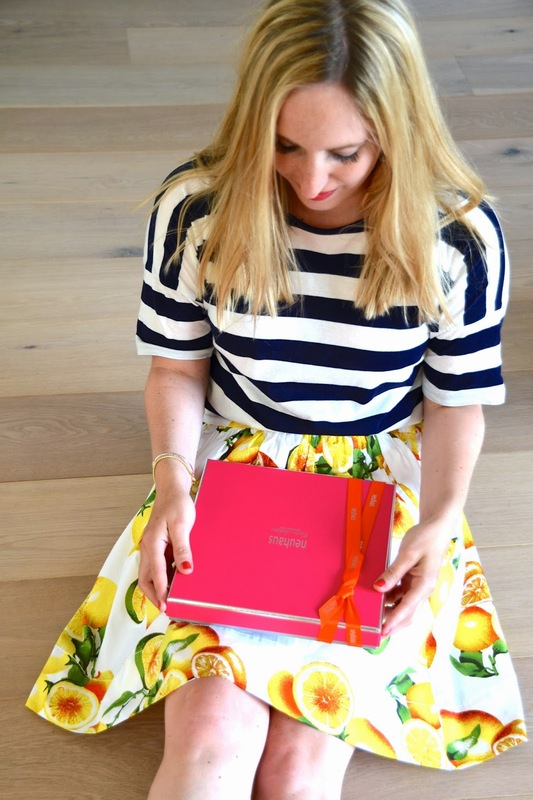 This post has it all: I love love love that cute skirt (I want something just like it!) and I love your pretty makeup and bright lips. And mmmm those chocolates and macarons look amazing!! oooh yum - those chocolates. I remember when I was in Bruges I used to eat loads of Leonidas. I love your skirt - very pretty. These chocolates look so delicious! And I love your skirt, dear! Aw they look so delicious!! And I really love your outfit too!